Dipak K. Dey has been selected as the winner of the 2018 Don Owen Award from the San Antonio chapter of the American Statistical Association. The Institute of Applied Statistics Sri Lanka (IASSL) recently (December 2017) awarded Professor Nitis Mukhopadhyay the prestigious Honorary Fellowship for his broad ranging contributions and service towards the Institute of Applied Statistics Sri Lanka (IASSL). The first Honorary Fellowship to IASSL was bestowed upon Professor C. R. Rao in 2011. Dr. Mukhopadhyay is the second honoree. Professor Dipak K. Dey received the 2018 Distinguished Science Alumni Award from College of Science at Purdue. Congratulations to our own PhD students Wenjie Wang and Yeongjin Gwon, each of whom received the IBM Best Paper Award at NESS 2017! Wenjie presented his paper ““Extended Cox Model by ECM Algorithm for Uncertain Survival Records Due to Imperfect Data Integration,” which he coauthored with faculty members Professor Kun Chen and Professor Jun Yan. Yeongjin’s paper ““Network Meta-Regression for Ordinal Outcomes: Applications in Comparing Crohns Disease Treatments” was coauthored with Professor Ming-Hui Chen, as well as May Mo, Juan Li, H. Xia Amy, Joseph Ibrahim. We congratulate our own PhD student Yang Liu, who has won an ACTNext Travel Award to attend the 2017 International Meeting of the Psychometric Society in Zurich, Switzerland. Yang will present his paper titled “Bayesian Nonparametric Monotone Regression of Dynamic Latent Traits in Item Response Models”, jointly written with Professor Xiaojing Wang. PhD Student Jing Wu was selected to receive one of the International Biometric Society Eastern North American Region’s (ENAR) Distinguished Student Paper Awards for the 2017 ENAR Spring Meeting in Washington, DC. Her paper entitled “Bayesian Modeling and Inference for Nonignorably Missing Longitudinal Binary Response Data with Applications to HIV Prevention Trials” is joint work with Professors Joseph G. Ibrahim, Ming-Hui Chen, Elizabeth Schifano, and Jeffrey D. Fisher. Jing will present her paper at the 2017 ENAR Spring Meeting. PhD student Gregory Vaughan was awarded the Student Paper Award Competition by the Mental Health Section of the ASA. His paper, “Stagewise Generalized Estimating Equations with Applications to Suicide Prevention”, was joint work with Professor Jun Yan and Assistant Professor Kun Chen, and was one of two papers awarded by the section. Greg will present his paper at JSM 2017. 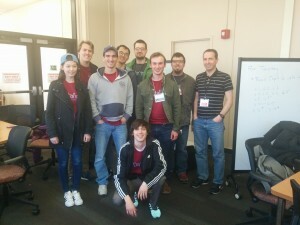 A team of UConn undergraduates–Daniel Brink ’16, Nicholas Illenberger ’17, Jiachen Liang ’16, and Peter Tallcouch ’16–won an award for “Best Business Insight” at the American Statistical Association (ASA) Datafest competition, held at Wesleyan University from April 8-10. The students’ task was to analyze a dataset provided by Ticketmaster, and provide some new insights. The students were advised by Professor Haim Bar, Professor Ofer Harel, and Professor Nalini Ravishanker and graduate students Henry Linder and Yaohua Zhang. Also in attendance to support the UConn team were graduate students Brian Bader, Ved Deshpande, and Greg Vaughan. Professor Sujit K. Ghosh, NC State University – who received his Ph.D. in 1996 at the University of Connecticut – has being elected President of the International Indian Statistical Association. A department alumnus, Professor Sujit K. Ghosh of North Carolina State University, has being selected for the prestigious 2016 Hind Rattan Award given by the NRI Welfare Society of India. Professor Ghosh graduated in 1996. The Hind Rattan (Hindi phrase translated to English as “Jewel of India”) is one of the highest Indian diasporic awards granted annually to non-resident Indian citizens (NRIs) by the NRI Welfare Society of India, an organization under the umbrella of the Government of India. The award is granted at the Society’s annual congress, held in conjunction with national Pravasi Bharatiya Divas celebrations. The award ceremony is attended by senior members of the Government of India and of the Supreme Court of India.